This lecture introduces Newton’s Laws of Motion. The First Law on inertia states that every object will remain in a state of rest or uniform motion in a straight line unless acted upon by an external force. The Second Law (F = ma) relates the cause (the force F) to the acceleration. Several different forces are discussed in the context of this law. The lecture ends with the Third Law which states that action and reaction are equal and opposite. Professor Ramamurti Shankar: Let me start again by reminding you what it is that was done last time. If you say, “Can you summarize for me in a few words the main ideas?” I would like to do that. What I did last time was to show you how to handle motion in more than one dimension. I picked for it two dimensions as the standard way to explain it. By the way, I would like to make one recommendation. If you guys are coming in a little late, don’t worry about submitting the homework. Just come in and settle down, because it’s very hard to lecture with this amount of traffic. I do try to start a few minutes late, but I also have to finish a few minutes early so you can go to your next class. Also, people who come in early maybe should try to sit in the middle part of the classroom, so the latecomers can come in without too much disruption. So, summary of last time. If you live in two dimensions or more, you’ve got to use vectors to describe most things. The typical vector is called V or A or B something with an arrow on it. The most important vector is the position vector that tells you where the object is. It’s got components which are x and y that could vary with time. I and J are unit vectors in the x and y directions. You can deal with a vector in one of two ways. You can either think of it as an arrow and imagine the arrow, or you can reduce it to a pair of numbers, x and y. If you want to add two vectors, you can add the arrows by the rule I gave you or just add the components of the two guys to get the component of the sum and likewise for the y.
I gave you a law of transformation of the components; namely, if the vector has components ax and ay in one reference frame and ax′ and ay′ in another reference frame, how are the two related? They come from writing I′ and J ′ in terms of I and J, then sticking it in an expression and identifying the new representation. Somehow, when I told you to invert the transformation, some of you had some difficulty. Maybe you didn’t realize that they are just simultaneous equations that you solve. Normally, if I tell you 3x + 4y = 6, and 9x + 6y = 14, you know how to solve it. It’s like really the same kind of problem, except that the 3 and 4 will all be placed by sin φ and cos φ but they are just the numbers. You eliminate them the same way you eliminate them. I’ve given you a homework problem where you can try your skills. When you go today and look at the homework, you’ll find the problem from the textbook, one extra problem that deals with all of this. Then, I gave you one other very important example of a particle moving in the xy plane. x and y can be whatever you like, but I picked a very special example where x looked like this: r times cos ωt. This times I + r times sin ωt. You should go back and remember what we did. If it took you a while to digest it, I ask you to think harder. This describes a particle that’s going around in a circle. We know it’s going around in a circle because if I find the length of this vector, which is the x-square part, plus the y-square part, I just get r2 at all times, because sine square plus cosine square is one. So we know it’s moving on a circle of radius r. Furthermore, as time increases, the angle, ωt, is increasing in this fashion. Omega is called the angle of velocity. I related it to the time period, which is the time it takes to go around a full circle, by saying once you’ve done a full circle, ωt better be 2π. So this new quantity ω, which may be new to you, is related to the time period. How long does it take to go one round in this fashion? You’re also free to write it in terms of the frequency. The time period and frequency are reciprocals. If it takes you 1/60 of a second to go around once, then you do it 60 times a second. Omega is really very simple quantity. It’s related to the frequency with which you go around the circle but is multiplied by 2π. Why is that? Frequencies, how many times you go around, and 2π is the rate at which the angle is being changed. But if every revolution is worth 2π radians, then 2πf is the number of radians per second. f is revolutions per second and 2πf is radians per second. It’s called the angle of velocity. The most important result from last time was that if you took this r, and you took two derivatives of this to find the acceleration, d2r over dt2, try to do this in your head. If you took the two derivatives of this guy, first time it will become -ω, sin ωt; second time it will become -ω2 cos ωt. In other words, it will become -ω2 times itself. Same thing there. The final result is the acceleration is -ω2 times the position. That means the acceleration is pointing towards the center of the circle and it has a magnitude a. When I draw something without an arrow, I’m talking about the magnitude. It is just ω2r. I have shown you yesterday that the speed of the particle as it goes around the circle is this (ωr). Again, you should make sure you know how to derive this. You can do it any way you like. You can take one full circle and realize the distance traveled is 2πr, divide by the time and you will get this. Another way, take the derivative of this, get the velocity vector and you notice his magnitude is a constant and the constant will be ωr. Whichever way you do it, you can then rewrite this as v2 over r. This is called the centripetal acceleration. This is the acceleration directed toward the center. I told you these are very important results. You’ve got to get this in your head. Whenever you see a particle moving in a circle, even if it’s at a constant speed, it has an acceleration, v2 over r directed towards the center. This formula doesn’t tell you which way it’s pointing, because it’s a scaler; it’s not a vector equation. If you want to write it as a vector equation, you want to write it as v2 over r minus–I want to say that it’s pointing in the direction toward the center. So sometimes what we do is we introduce a little vector here called er. I’ll tell you more about it later. er is a vector at each point of length one pointing radially away from the center. It’s like the unit vector I. Unit vector I points away from the origin in the x direction. J points away from the origin in the y direction. er is not a fixed vector. At each point, er is a different vector pointing in the radial direction of length one. The advantage of introducing that guy is that if you like, I can now write an equation for the acceleration as a vector. The magnitude is v2 over r. The direction is -er. So er is a new entity I’ve introduced for convenience. It plays a big role in gravitation, in the Coulomb interaction. It’s good to have a vector pointing in the radial direction of length one. That’s what it is. That’s really the heart of what I did last time. Then we did some projectile problems. You shoot something, you should know when it will land, where it will land, with what speed it will land, how high it will go. I assume that those problems are not that difficult and I’ve given you a lot of practice. Now I’m going to move to the really important and central topic. I guess you can guess what that is. We’re going to talk about Newton’s laws. This is a big day in your life. This is when you learn the laws in terms of which you can understand and explain a large number of phenomena. In fact, until we do electricity and magnetism the next semester, everything’s going to be based on just the laws of Newton. It’s really amazing that somebody could condense that much information into a few, namely three, different laws. That’s what we’re going to talk about. Let’s start. Your reaction may be that you’ve seen Newton’s laws, you applied them in school. I’ve got to tell you that I realized fairly late in life they are more subtle than I imagined the first time. It’s one thing to plug in all the numbers and say, “I know Newton’s laws and I know how they work.” But as you get older and you have a lot of spare time, you think about what you are doing, which is something I have the luxury of doing right now, and I realized this is more tricky. I want to share some of that with you so you can fast forward and get the understanding it took me much longer to get. That’s what I’m going to emphasize, more than just plugging in the numbers. Of course, we have to also know how to plug in the numbers so we can pass all the tests, but it’s good to understand the nature of the edifice set up by Newton. First statement by Newton–I don’t feel like writing it down. It’s too long and everybody knows what the law is. It’s called the Law of Inertia. Let me just say it and talk about it. The Law of Inertia says that, “If a body has no forces acting on it, then it will remain at rest if it was at rest to begin with, or if it had a velocity to begin with, it will maintain that velocity.” One way to say it is, every body will continue to remain in a state of rest or uniform motion in a straight line. That’s another way of saying maintaining velocity if it’s not acted upon by a force. What makes the law surprising is that if I only gave you half the law, namely every body will remain at rest if it’s not acted upon by a force, you will say, “That’s fine. I accept that, because here’s something. You leave it there, it doesn’t move. It’s not a big surprise.” People were used to that from the time of Aristotle. But Aristotle used to think that if you want something to move, there has to be some agency making it move. That agency you could call force. The great discovery that Galileo and Newton made is that you don’t need a force for a body to move at constant velocity. It’s very clear you don’t need a force if something is doing nothing, just sitting there. The fact that you don’t need a force for it to move forever at a given speed in a given direction, that’s not obvious, because in daily life you don’t see that. In daily life, everything seems to come to rest unless you push it or you pull it or you exert some kind of force. But we all know that the reason things come to a halt when you push them is, there eventually is some friction or drag or something bringing them to rest. Somehow, if you could manufacture a really smooth frictionless surface, that if you took a hockey puck or something and an air cushion and you give it a push, in some idealized world, it’ll travel forever. So it’s hard to realize that in the terrestrial situation. But Galileo already managed to find examples where things would roll on for a very, very long time. Nowadays, if you go to outer space, you can check for yourself that if you throw something out, it just goes on forever without your intervention. It’s in the nature of things to go at a constant velocity. They don’t need your help to do that. You have to be careful that this first law of Newton is not valid for everybody. In fact, I’ll give an example in your own life where you will find that this law doesn’t work. Here is the situation. You go on an airplane and then after the usual delays, the plane begins to accelerate down the runway. At that instant, if you leave anything on the floor, you know it’s no longer yours. It’s going to slide down and the guy in the last row is going to collect everything. Why is that? Because we find in that plane, when objects are left at what you think is at rest with no external agency acting on them, they all slide backwards towards the rear end of the plane. That happens during takeoff. That doesn’t happen in flight, but it happens during takeoff. That is an example of a person for whom the Law of Inertia does not work. This is something you guys may not have realized. Newton’s laws are not for everybody. You have to be what’s called an “inertial observer.” If you’re an inertial observer, then in your system of reference, objects left at rest will remain at rest. The plane that’s ready to take off or is taking off is not such a system. The Earth seems to be a pretty good inertial system, because on the ground, you leave something, it stays there. It depends on what you leave. If you leave your iPod, it’s not going to stay there for very long. But then you can trace it to some external forces, which are carrying your iPod. But if you don’t do anything, things stay. Here is the main point. The point of Newton is, two things in the Law of Inertia, which one may think is trivial. First, free velocity, constant velocity can be obtained for free without doing anything. There are people for whom this is true. For example, in outer space, you’ve got an astronaut. You send something, you’ll find it goes on forever. Here’s another thing. If you find one inertial observer, namely one person for whom this Law of Inertia works, I can manufacture for you an infinite number of other people for whom this is true. Who are these other people? Do you know what I’m talking about? If I give you one observer for whom the Law of Inertia is true, I say that others for whom is also true. Yes? Professor Ramamurti Shankar: Did you hear that? Let me repeat that. First of all, if the Law of Inertia is valid for me, it’s valid for other people in the same room at rest with respect to me. Because if I think it’s not moving, you think it’s not moving. That’s just fine. But suppose you are in a train and you’re moving past me and you look at this piece of chalk. Of course, everything in my room is going backwards for you. But things which were at rest will move at a constant velocity, opposite of the velocity that you have relative to me. You will find that objects that are at constant initial velocity maintain the velocity. If I am an inertial observer, another person moving relative to me at constant velocity will also be an inertial observer. Why? Because any velocity I ascribe to a particle or an object, you will add a certain constant to it by the law of composition of velocity. All velocities I see you will add a certain number to get the velocities according to you. But adding a constant velocity to objects does not change the fact that those which were maintaining constant velocity still maintain a constant velocity. It’s a different constant velocity. In particular, the things that I say are at rest, you will say are moving backwards at the velocity that you have relative to me. Things that I say are going at 50 miles per hour you may say are going at 80. But 50 is a constant and 80 is a constant. Therefore, it’s not that there’s only one fortunate family of inertial observers. There’s infinite number of them, but they’re all moving relative to each other at constant velocity. If the Earth is an inertial frame of reference, if you go in a train relative to the Earth at constant velocity, you’re also inertial. But if you go on a plane which is accelerating, you’re no longer inertial. That’s the main point. The point is that there are inertial frames of reference. You must know the Earth is not precisely inertial. The Earth has an acceleration. Can you tell me why I’m sure the Earth has an acceleration? Yes? Student: Because it’s moving in a circle. Professor Ramamurti Shankar: It’s going around the Sun. Let’s imagine it’s a circular orbit. Then we’ve just shown here, it’s an accelerated frame of reference. It just turns out that if you put the v2 and you put the r, and r is 93 million miles, you will find the acceleration is small enough for us to ignore. But there are effects of the Earth’s acceleration, which we’ll demonstrate. The Focault pendulum is one example where you can see that the Earth is rotating around its own axis. Then, the fact that the Earth is going around the Sun. All of them mean it’s really not inertial, but it’s approximately inertial. But if you go to outer space nowadays, you can find truly inertial frames of reference. That’s the first law. The first law, if you want, if you want to say, “Okay what’s the summary of all of this?” The summary is that constant velocity doesn’t require anything. The reason it looks like a tautology, because you look around, nothing seems to have its velocity forever. Then you say, “Oh, that’s because there’s a force acting on it.” It looks like a tautology because you’re never able to show me something that moves forever at a constant velocity, because every time you don’t find such a thing, I give an excuse, namely, a force is acting. But it’s not a big con, because you can set up experiments in free space far from everything, where objects will, in fact, maintain their velocity forever. That’s a possibility. It’s a useful concept on the Earth, because Earth is approximately inertial. That’s where I want to tell you that it’s actually more complicated than that. Let’s really look at this equation. Take yourself back to 1600-whatever, whenever Newton was inventing these laws. You don’t know any of these laws. You have an intuitive definition of force. You sort of know what force is. Somebody pushes you or pulls you. That’s a force. Suddenly, you are told there is a law. Are you better off in any way? “Can you do anything with this law?” is what I’m asking you. What can you do with this law? I give you Newton’s law and say, “Good luck.” What will you do? What does it help you predict? Can you even tell if it’s true? Here’s a body that’s moving, right? I want you to tell me, is Newton right? How are we going to check that? Well, you want to measure the left-hand side and you want to measure the right-hand side. If they’re equal, maybe you will say the law is working. What can you measure in this equation? Professor Ramamurti Shankar: Pardon me? Professor Ramamurti Shankar: All right. Let’s start with acceleration. What’s your plan for measuring acceleration if some little thing is moving? What do you need to measure it? Professor Ramamurti Shankar: Right, but what instruments will you need to measure it? You are supposed to really measure it. What will you ask me for? Professor Ramamurti Shankar: A watch? Yes. Professor Ramamurti Shankar: And what else? Professor Ramamurti Shankar: A ruler? Okay. That’s right. You don’t mean Queen Elizabeth, right? You mean– Very good. What you really want–a ruler may not be enough, but maybe it’s enough. So here’s the long ruler and here’s this thing moving, right? You ask for a Rolex so here’s your watch. It’s telling time. Tell me exactly what you want to do to measure acceleration. What do you have to do? I want the acceleration now. What will you measure? Okay, you go ahead. You can try. Professor Ramamurti Shankar: It may not be at rest to begin with. It’s doing its thing. It’s going at some speed. Yes? Student: Measure the distance it travels over a constant interval of time? Professor Ramamurti Shankar: That’ll give you the velocity. Student: Well, if you do distance after one second versus distance over the next second versus distance over a third second, you see how it increases. Professor Ramamurti Shankar: Good, in principle. Let me repeat what he said. He said, first, let it go a little distance, take the distance over time. That gives you the velocity now. Let it go a little more, that gives you the velocity later. Take the difference of the two velocities and divide by the difference of the two times, and you’ve got the acceleration. Of course, you have allowed it to move a finite distance in a finite time. What you should imagine doing is making these three measurements more and more quickly. You need three positional measurements. Now, a little later, and a little later later, because between the first and second, you get a velocity, the second and third you get another velocity. Their difference divided by the difference in times is going to be the acceleration. But if you imagine making these measurements more and more and more quickly, in the end, you can measure what you can say is the acceleration now. That’s the meaning of the limit in calculus. You take Δx and you take Δt. What’s the meaning of Δx and Δt going to 0? It means, measure them as quickly as you can. In the real world, no one’s going to measure it instantaneously, but we can make the difference as small as we like. Mathematically, we can make it 0. In that limit, we can measure velocity right now. That means we can also measure velocity slightly later and make the slightly later come as close to right now as we want. Then, that ratio will give you acceleration. Acceleration is the easiest thing to measure of these three quantities. We all have a good intuitive feeling for what acceleration is. You want to test if what Newton told you is right. You see an object in motion, you find a and you give a a certain numerical value, 10 meters per second squared. But that’s not yet testing the equation, because you’ve got to find both sides. What about the mass? What’s the mass of this object? Anybody want to try from this section here? Yes? Student: You could use some sort of a standard unit of mass and then a balance to measure the mass of something else, like put it at a certain distance from the fulcrum on a scale and figure out the relative mass. Professor Ramamurti Shankar: Okay. His idea was the following. You take a standard mass and you maybe go to a seesaw. You put the standard mass here and you put some other fellow at the mass you’re looking at there. You add just the lengths and when it balances, you can sort of tell what this mass is, right? But suppose you were in outer space. There’s no gravity. Then the seesaw will balance, even if you put a potato on one side and an elephant on the other side. You cannot tell the mass, because what you are doing now is appealing to the notion of mass as something that’s related to the pull of the Earth on the object. But Newton’s law is–You see, you’ve got to go back and wipe out everything you know. If this is what you have, there is no mention of the Earth in these equations. Yet, the notion of mass is defined. It’s not talking about the gravitational pull of the Earth on an object. Yes? Student: If you had an object that you say has a certain mass that you don’t know and then you took one that’s the same density, but say twice the size and you can see if it slows the force. Professor Ramamurti Shankar: But do you know what the force on the body is? We don’t know how to measure that either; do you agree? We don’t know what the force is, because we are hoping to say force is going to be m times a. We’re just getting on to measuring m. It looks like a circular definition right now. Yes? Professor Ramamurti Shankar: Ah, but density is mass over volume. But we don’t know the mass, right? Professor Ramamurti Shankar: How is anyone going to give you a density of anything? We’re just asking what’s the mass of any object? We have not yet found a satisfactory answer to what’s the mass of an object? Yes? Student: Are we still operating in outer space? Professor Ramamurti Shankar: Yes. This cannot depend on the planet Earth. Student: Could we have, by any chance, a spring? Professor Ramamurti Shankar: I’m sorry. What did you just say? You can have a spring. Student: Yeah, you could have a spring and you could compare how fast that objects will travel when the spring is compressed and they’re placed against it and released, but you’d only have a comparison then. Professor Ramamurti Shankar: Okay. Let me repeat what he said. He said, take a spring to outer space and we’ll hook up some objects to them and see how fast they move and do a comparison. That’s fairly close to what I had in mind. But it’s not the word perfect answer. I just want to take some time thinking about it. Yes? Professor Ramamurti Shankar: What do I learn from the period? Professor Ramamurti Shankar: Remember, you cannot peek into chapters 6 and 7, because you’ve seen it before. I’m asking you if somebody wrote apparently Shakespeare’s plays for him; it’s one of the rumors, right? Suppose Newton comes to you and says, “I have this great law, but I don’t want to publish it under my name. I’m going to give it to you.” You have got this new law, but how are you going to sell this? You’ve got to tell people how to use it. You realize it’s very subtle, because the very first thing in that equation, which is m, has not yet been defined. He gave an answer which is fairly close. It doesn’t rely on gravity. It doesn’t rely on the planet. You cannot say to me, “Take a force, due to a spring, and see what force it applies and divide by the acceleration and get the mass,” because we haven’t defined force either. You’ve got to realize that. Let me ask you something. How do we decide how long a meter is? Can you tell me, how do you know how long a meter is? Student: It’s just sort of arbitrary. Student: You can just pick an arbitrary mass, as well, like one object, which is an arbitrary mass. Professor Ramamurti Shankar: And we’ll call it. First thing you’ve got to do is, realize that some of these things are not God-given. A meter, for example, is not deduced from anything. Napoleon or somebody said, “The size of my ego is one meter.” That’s a new unit of length. You take a material like silver and put it in a glass case and that’s the definition of a meter. It’s not right or wrong. Then I ask you, “What is two meters and what is three meters?” We have ways of doing that. I take the meter and put it next to the meter, that’s two meters. I cut it in half, I’ll use some protractors and dividers and compasses, you can split the meter into any fraction you like. Likewise for mass, we will take a chunk of some material and we will call it a kilogram. I should give you some hint. That kilogram, I don’t expect you to deduce. That is a matter of convention. Just like one second is some convention we use and one meter is some convention we use. I’m going to give you a little help. I’m going to give you a glass case and in the glass case is an entity with this as one kilogram, by definition. Then I give you another object, an elephant. Here’s an elephant. I’m telling you, “What’s the mass of the elephant?” How do you find this mass? You got to take the hint he gave. I give you a spring and an elephant. What should we do? Yes? Professor Ramamurti Shankar: No. Remember, when we hang the elephant in outer space, nothing is going to happen. Student: Okay. You push the elephant and measure how far– what the distance from the unstretched spring is that the elephant travels in either direction. Student: Then, you also do that with one kilogram. It should be proportional to how far from the resting state of the spring. That should be the proportion that the one kilogram object is to the other. Professor Ramamurti Shankar: When you say, “push the elephant,” you want to push it in a particular way? What do you want to do? Professor Ramamurti Shankar: That is correct, but you don’t want to give it a definite push. Yes? 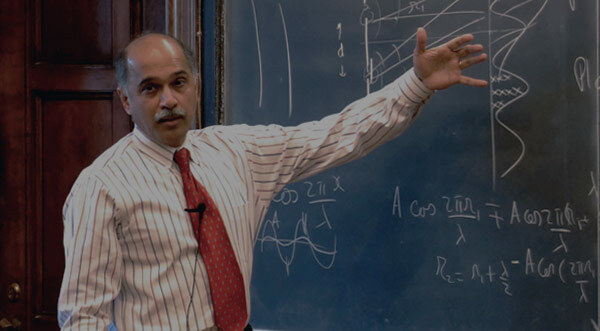 Student: Do you push it radially along the axis of the spring, because you know that the centripetal force is mv2 is over t.
Professor Ramamurti Shankar: Yeah. Maybe that’s an interesting thing. That’s correct. You can do that, too. Let me now put you out of your suspense. I think I’ve heard bits and pieces of the answer everywhere, so I don’t want to wait until we get it word-perfect. The point is, the one kilogram is a matter of convention. We want to know what is the mass of the elephant. We can do the seesaw experiment, you suggested, but the seesaw experiment requires gravity, so we don’t want to do that. A spring will, on the other hand, exert a force. We don’t know what the force of the spring is. If you assume that, you are not playing by the rule, because we don’t know what force it exerts. We do know it exerts a force, so here’s what you do. You hook one end of the spring to a wall and you pull it from rest by some amount and you attach the one kilogram mass to it. Yes? Student: One problem that we’d have, though, is if we’re in outer space, where are we going to find a wall that won’t move? Professor Ramamurti Shankar: A wall that will not move? Student: It won’t move very much? Professor Ramamurti Shankar: No, it won’t move very much. Once we know enough dynamics, we can answer your question. Does outer space even rob you of something to which you can anchor a spring? The answer is, “no.” You can anchor things to objects in outer space. They just won’t act the way gravity does. But you can nail it to the wall and pull one end. So you pull one end. We don’t know what force it exerts. But it exerts some force. Now, I tie this one kilogram mass to it and let it go. I find the acceleration. That is the force which I do not know in magnitude. But this is the acceleration of the one kilogram mass. Then, I bring the elephant and I pull the spring by the same amount and I find the acceleration of the elephant and the denominator is obviously the mass of the elephant. The force is not known, but it’s the same force. So, when I divide these two numbers, I’m going to find a1 over aE is equal to mE over m, which is the one kilogram mass. What we needed was some mechanism of exerting some fixed force. We didn’t have to know its magnitude. But the acceleration it produces on the elephant and on the mass, are in an inverse ratio of their masses. If you knew this was one kilogram, then the acceleration of the elephant, which will be some tiny number, maybe 100th of what this guy did; the mass of the elephant is then 100 kilograms. Note there are, again, subtleties even here. If you think harder, you can get worried about other things. For example, how do I know that when I pull the spring the first time for the mass, it exerted the same force when I pulled the spring the second time for the elephant? After all, springs wear out. That’s why you change your shock absorbers in your car. After a while, they don’t do the same thing. First, we got to make sure the spring exerts a fixed force every time. You can say, “How am I going to check that? I don’t have the definition of force yet.” But we do know the following. If I pull the one kilogram mass and I let it go, it does something, some acceleration. Then, I pull it again by the same amount and let it go; I do it 10 times. If every time I get the same acceleration, I’m convinced this is a reliable spring that is somehow producing the same force under the same condition. On the eleventh time, I pull the mass. I will put the elephant in. With some degree of confidence, I’m working with a reliable spring and then I will get the mass of the elephant. Why is it so important? It’s important for you guys to know that everything you write down in the notebook or blackboard as a symbol is actually a measured quantity. You should know at all times how you measure anything. If you don’t know how to measure anything, you are doing algebra and trigonometry. You are not doing physics. This also tells you that the mass of an object has nothing to do with gravitation. Mass of an object is how much it hates to accelerate in response to a force. Newton tells you forces cause acceleration. But the acceleration is not the same on different objects. Certain objects resist it more than others. They are said to have a bigger mass. We can be precise about how much bigger by saying, “If the acceleration of a body to a given force is ten times that of a one kilogram mass, then this mass is one-tenth of one kilogram.” This is how masses can be tabulated using a spring. You got to understand what the minus sign is doing here. This is the force exerted by the spring on the mass. It says, if you pull it to the right, so that x is positive, the spring will exert a force which is in the negative direction; that’s why you have a minus sign. Then, all springs will do something like this. Further out they can do various things. The force may taper off, the force may not be given by a straight line, but for modest deformations, every spring will have a linear regime in which the force is linearly proportional to the stretching. It also tells you that if you compress the spring, compress it means x is now–x is measured from this position, where the spring is neither compressed nor expanded. So x is not really the coordinate of the end point. You’ve got to understand that. Springs have a natural length; x is measured from that length. If it’s positive, it means you’ve stretched it, if it’s negative, it means compressed. This equation is telling you if you compress it, namely if x is negative, F will be then positive, because it’s pushing you outwards. Therefore, what we have done now is, we can take all kinds of springs and we can calibrate the force they will exert under various conditions. Namely, if you pull it by so much, that’s the force it will exert. I want you to think for a second about two equations. One equation says F = ma. Other equation says F=-kx. What’s going on? Is one of them Newton’s law? Then what’s the other one? Maybe F = -kx should be called Newton’s law? Why is F = ma called Newton’s law? Then, what’s the meaning of this expression? What’s the difference between saying F = -kx and F = ma? They are saying very different things. Yes? Student: F = ma is a universal law. Professor Ramamurti Shankar: Right. Let me repeat. F = ma is universally true, independent of the nature of the force acting on a body. Then? Student: F = -kx is only describing how the spring is. Professor Ramamurti Shankar: Very good. That’s the whole point. The cycle of Newtonian dynamics has two parts. First one says, if you knew the force acting on any body, without going into what caused the force, then you may set that force equal the mass times acceleration of the body. We think of force as the cause and a as the result or the effect. Force causes acceleration and this is a precise statement. There, Newton doesn’t tell you what forces are going to be acting on a body in a given situation. If you leave the body alone, maybe there’s no force acting on it. If you connect the body to a spring, which is neither compressed nor extended, there’s no force acting on it. If you pull the spring, there is a force acting on it. Newton is not going to come and tell you what force the spring will exert when it’s pulled by some amount. That is another part of your assignment. The physicist has to constantly find out what forces act on bodies. That’s a separate exercise. In every context in which I place a body, I’ll have to know what are the forces acting on it. I’ve got to find them by experimenting, by putting other bodies and seeing how they react and then finding out what’s the force that acts on a body when it’s placed in this or that situation. Once you’ve got that, then you come back. In the case of a spring, this is the law that you will deduce. If it’s something else, you will have to deduce another law. For example, we know that if a body is near the surface of the Earth, the force of gravity and that object seems to be m times g, where g is 9.8. That’s something you find out by experiment. Every time you are finding out a different force that’s acting on a body with different origin. One says, leave any body near the Earth, it yields a force. I know this is the right answer, because if I now find the acceleration, I find it’s mg divided by m and I get -g as the answer for all bodies. By the way, that’s a very remarkable property of the gravitational force–the cancellation of the two ms. If you look at the electrical force, the force of electricity, on the proton and electron or something, it’s not proportional to the mass of either object. It’s proportional to the electric charge of either object. Therefore, when you divide by the mass to get the acceleration, the response of different bodies is inverse to the mass. But gravity has a remarkable property that the pull of the Earth is itself proportional to the inertia of the object. So, when you divide by m, m cancels and everything falls at the same rate on the surface of the Earth. In fact, there’s a property of gravitational fields anywhere, even in outer space, but there is some residual field between all the planets and all the stars in the universe, that the force on a body is proportional to the mass of the body. So, when you divide by the mass to get the acceleration, you get the same answer. Everything – gold, silver, diamonds, particles – everything accelerates the same way in a gravitational field, due to this remarkable fact. This was known for a long time, but it took Mr. Einstein to figure out why nature is behaving in that fashion. If I have some time, I’ll tell you later. But there are two qualities which happen to be equal. One is inertial mass, which is how much you hate your velocity to change, how hard you resist acceleration. That exists far from planets, far from everything. Other is gravitational mass, which is the measure of how much you’re attracted to the Earth. There’s no reason why these two attributes had to be proportional, but they are proportional and they are equal by choice of units and you can ask, “Is this just an accident or is it part of a big picture?” It turns out, it’s part of a big picture and all of general relativity is based on this one great equivalence of two quantities which are very different attributes. Why should the amount by which you’re attracted to the Earth be also a measure of how much you hate acceleration? Two different features, right? But they happen to be the same. Anyway, what physicists do is they put bodies in various circumstances and they deduce various forces. This is the force of gravity. This is the force of the spring. Here’s another force you might find. You put a chunk of wood on a table and you try to move it at constant speed. Then you find that you have to apply minimum force. We are moving at constant velocity. That means the force you’re applying is cancelled by another force, which has got to be the force of friction. So force of friction is yet another force. Then, there are other forces. You guys know there is the electrical force. If you bring a plus charge near a plus charge, if my body m, has a plus charge and another plus charge is there, it’ll feel a force due to that. That’s not going to be given by Newton. So, Newton did not ever tell you what the expression for force is in a given context. That is a constant study. Coulomb discovered the Coulomb’s law, which is a repulsion between charges. Nowadays we know if you go into the neutron or the proton, there are quarks. There are forces between the quarks. You can ask what the force that this quark will exert and that quark at a certain separation. That was obviously not known to Newton. Remember, Newton said F = ma, but didn’t tell you what value F has in a given context. He just said whenever there’s an acceleration, it’s going to be due to some forces and it’s your job to find what the forces are. To find the force, what you will do is, suppose somebody says, “Hey, I’ve got a new force. Every time I go near the podium, I find I’m drawn to it.” Okay, that’s a new force. The word gets around and we want to measure the force. What do I do? I stand near this podium. I’m drawn to it. I cannot stop. I tie a spring to my back and I anchor it to the wall and see how much the spring stretches before the two forces balance. Then I know that kx is equal to the force this is exerting at this separation. I move a little closer and I find the stretching is a different number. Maybe the force is getting stronger. That’s how by either balancing the unknown force with a known force or by simply measuring the acceleration as I fall towards this podium and multiplying by mass, you can find the force that exerts on me. It’s not a cyclical and useless definition. It’s a very interesting interplay and that’s the foundation of all of mechanics. We are constantly looking for values of F and we’re constantly looking for responses or bodies to a known force. Here’s a simple example of a complete Newtonian problem. A mass is attached to a spring. It is pulled by a certain amount x, and is released. What is it going to do? We go to Newton. Newton says F = ma, so to make it a useful result of this problem, we know the mass of this guy. We did the comparison with the elephant or something; a is the second derivative of x and for this problem, when F is due to a spring, we know the force is that by studying the spring. Suddenly, you have a mathematically complete problem. Mathematically complete problem is that you can find the function x(t) by saying that the second derivative of the function is equal to -k over m times the function. Then, you go to the Math Department and say, “Please tell me what’s the answer to this equation?” We don’t have to worry about how you solve it, but it’s problem in mathematics and the answer will be–surprise, it’s going to be oscillating back and forth and that’ll come out of the wash. This is how you formulate problems. You can formulate another problem. Later on, we know about gravity. Newton finds out there’s a force of gravity acting on everything. Here’s the Sun. Here’s your planet. At this instant, the planet may be moving at that speed. Then the acceleration of the planet is the force of gravity between the planet and the Sun, which Newton will tell you is directed towards the Sun and it depends on how far you are. Depending on how far the planet is from the Sun and where it’s located, you will get the left-hand side. That’s another law. That’s the Law of Universal Gravitation. Then again, you will find the evolution of the planetary motion, because the rate of change of the position is connected to the position. Again, go to the math guys and say, “What’s the answer to that?” and they tell you the answer, which will be some elliptical motion. Okay. By the way, Mr. Newton did not have math guys he could go to. Not only did he formulate laws of gravitation, he also invented calculus and he also learned how to solve the differential equation for calculus. He probably felt that nobody around was doing any work, because all the thing was given to this one person. It’s really amazing that what Newton did in the case of gravity was to find the expression for this. A few years earlier he had also gotten this law. By putting the two together, out comes the elliptical motion of the planets. We’ll come back to that, but you have to understand the structure of Newtonian mechanics. Generally, any mechanics will require knowledge of the force. Now, I’m going to add one more amendment. You don’t have to write in your notebook, but you’ve got to remember. Maybe you’ll but a little T and circle it. Let me write it here. FT means the total force on a body. You’ve got many forces acting on a body. The acceleration is controlled by the sum. If I’m now working in one dimension, it’s obvious because I’m not using any vectors. Then, you may have forces to the right, forces to the left pushing, pulling. You add them all up algebraically, keeping track of their sign, and that’s the total force. That’s connected to mass times acceleration. Now, I’ll give you the third law. The third law says that if there are two bodies, called one and two, force of one on two is minus the force of the second on the first one. This is the thing about action and reaction. All the laws that anybody knows have this property. What does it require to be a successful mechanic, to do all the mechanics problems? You got to be good at writing down the forces acting on a body. That’s what it’s all going to boil down to. Here is my advice to you. Do not forget the existing forces and do not make up your own forces. I’ve seen both happen. Right now at this point in our course, whenever you have a problem where there is some body and someone says, “Write all the forces on it”, what you have to do is very simple. Every force, with one exception, can be seen as a force due to direct contact with the body. Either a rope is pulling, a rope is pushing it, you are pushing it, you are pulling it. That’s a contact on the body. If nothing is touching the body, there are no forces on it, with one exception which is, of course, gravity. Gravity is one force that acts on a body without the source of the force actually touching it. That’s it. Do not draw any more forces. People do draw other forces. When a body is going around a circle, they say that’s some centrifugal force acting. There is no such thing. Be careful. Whenever there is a force, it can be traced back to a tangible material cause, which is all the time a force of contact, with the exception of gravity. Okay, so with that, if you write the right forces, you will be just fine. You will be able to solve all the problems we have in mechanics. I’m going to now start doing simple problems in mechanics. They will start out simple and, as usual, they will get progressively more difficult. Let’s start with our first triumph will be motion in 1D. Here is some object, it’s 5 kilograms and I apply 10 Newtons. Someone says, “What’s the acceleration?” Everyone knows it is 10 over 5 equals 2. Now we know how we got all the numbers that go into the very question. How do we know 10 Newtons is acting? I think you people know how we can say that with confidence. How do we know the mass of this is 5 kilograms? We know how you got that from an earlier experiment. Now, we know how the numbers come in. The algebra is, of course, very trivial here. Then, the next problem is a little more interesting. Here I got 3 kg and I got 2 kg and I’m pushing with 10 Newtons and I want to know what happens. One way is to just use your common sense and realize that if you push it this way, these two guys are going to move together. And know intuitively that if they move together, they will behave like an object of mass 5 and the acceleration will again be 2. But there’s another way to do this and I’m going to give you now the simplest example of the other way, which is to draw free-body diagrams. By the way, when I say there’s 10 Newtons acting this way, you might say, “What about gravity? What about the table?” Imagine that this is in outer space where there is no gravity for now. The motion is just along the x axis. The free-body diagram, it says you can pick any one body that you like and apply F = ma to it, provided you identify all the forces acting on that body. We’ll first pick the body, with mass 3. Here’s the body of mass 3. What are the forces on it? This is certainly acting on it. Then, you have to ask, “What other force is acting?” Here is where you have to think. Anybody want to guess from the last row what force? Yes? Student: The reactive force of 2 on 3? Professor Ramamurti Shankar: Right. So let’s give it a name. Let’s point it that way and call it F2 on 3. That’s the end of this guy. Let’s look at the other fellow. Maybe you should complete the force acting on this one. Can you tell me what it is? Same person in the last row. Professor Ramamurti Shankar: And how big is that? Student: The same as F2, 3. Professor Ramamurti Shankar: Right. I don’t want to give it too many different names, because F2, 3 and F3, 2 are equal and opposite. I’m already showing F2, 3 acting to the left. Let me give it some other name like f. Then you agree this will be the same f but pointing that way. Here is the mistake some people make. They add to that the 10 Newtons. It’s the 10 Newtons acting on it, because I know the 10 Newton is pushing me and I’m going to feel it even if I’m here. That will be a mistake. That’s an example of adding a force that you really shouldn’t be adding. The only force acting on this guy is this little f. That’s, in turn, because this guy’s being pushed by the 10 Newtons, but that’s not your problem. Your problem is to only look at the forces of contact on you, and that is just this f. Then we do F = ma for these two guys. For this guy, F = ma will be 10 minus f is 3 times a. The other one, it’ll be f = 2a. Notice I’m using the same acceleration for both. I know that if the second mass moved faster than the first one, then the picture is completely wrong. If it moved slower than the first one, it means it’s rammed into this one. That also cannot happen, so they’re moving with the same acceleration. There’s only one unknown a. Once you got this, you realize what you got to do. This equation is begging you to be added to this equation. You got a plus f and a minus f, so you got to do what you got to do. You add the two, you get 10 = 5a and you get a = 2. Once you got a = 2, you can go back and realize here that f = 4, so you got really 4 Newtons. Now, we know the full story. 4 Newtons acting on 2 kg, gives you an acceleration of 2. On this guy, I have 10 from the left and I have 4–10 acting this way, 4 acting that way. That is 6 Newtons divided by 3 kg is also an acceleration of 2. This is a simpler example. A simple example of free body diagrams. Very simple. If you can do this, you can do most of the problems you will run into. Just don’t add stuff that’s not there. That’s all you have to be careful about. The stuff that people tend to add sometimes is to keep drawing the 10 Newtons that’s acting on that. Now, here’s another variation. The variation looks like this. I got 3 kg and I have a rope. I got 2 kg and I pull this guy with 10 Newtons. What’s going to happen? Again, your common sense tells you, “Look, you are pulling something whose effective mass seems to be 5, the answer is 2.” Let’s get that systematically by using free-body diagrams. Now, there are really three bodies here. Block one and block two and the rope connecting them. In all these examples, this rope is assumed to be massless. We know there is no thing called a massless rope, but most ropes have a mass, but maybe negligible compared to the two blocks you are pulling, so we’ll take the idealized limit where the mass of the rope is 0. Here is the deal. 3 kg is being pulled by the rope on the right with a force that I’m going to call T, which stands for tension. The rope is being pulled backwards by this guy, the T. What is the force on the other side? What should that be? Who said T? Why is it definitely T and not something else? What would happen if it’s something else? Professor Ramamurti Shankar: It won’t snap, but something else will be a problem. Yes? Professor Ramamurti Shankar: Not only faster, but what will be its acceleration? If the two forces don’t cancel, you have a net force. What are you going to divide by to get the acceleration? Professor Ramamurti Shankar: Zero, right? So, a massless body cannot have a net force on it, because the acceleration of the rope cannot be infinite. In fact, it has to be some finite number, which is the acceleration of either of these two guys. So, massless bodies will always have, like a massless rope, equal and opposite forces on the two ends. That is called the tension on the rope. When you say the rope is under tension being pulled from both sides by a certain force, the tension is not 0 just because this T and that T cancel. It’s true the net force is 0, but it doesn’t mean you can ignore it. Suppose you are being pulled by my favorite animals – the elephants – from both sides by equal force. You don’t find any consolation in the fact that these forces add up to 0. You feel the pain. That pain is what–This gentleman doesn’t agree. One of you guys nodding your head. Do you feel the pain? Do you agree? Okay. That force is called a tension. Whenever you’re asked on a problem, “What’s the tension on the rope?” you’re looking for that equal and opposite forces acting at two ends of the rope. We don’t know what it is. We’ll give it a name, but by linking that T to that T, we can also figure out the same T must be exerted on this one by Newton’s third law, because if this block is the only one that could be pulling this rope with T. Therefore, the ropes will be pulling the block with T in the other direction, then I got 10 Newtons here. Now, you can do F = ma for the three different objects. There’s nothing to do here, because the forces are 0, the mass is 0. It doesn’t tell you anything. The first one tells you T = 3a. The other one tells you 10 - T = 2a. Again, we know what to do. We add these numbers and we get 10 = 5a. Therefore, we find a = 2. Once you find a = 2, you find T = 6. So, tension on the rope is 6 Newtons. This is very important, because when you buy a rope, they will tell you how much tension it can take before it’ll snap. If your plan is to accelerate a 3 kg mass with an acceleration of 2 meters per second, you better have a rope that can furnish that force and it can take the tension of 6 Newtons. Now, for the- whoa! I’m going to give the last class a problem which is pretty interesting, which is what happens to you when you have an elevator. Here is a weighing machine and that’s you standing on the elevator. We’re going to ask, “What’s the needle showing at different times?” First, take the case in the elevator is on the ground floor of some building and completely addressed. Then, let’s look at the spring. The spring is getting squashed because you are pushing down and the floor is pushing up. You are pushing down with the weight mg, and the floor has got to be pushing up with the md, because the spring is not going anywhere. So the spring is being pushed by mg here and mg here. Therefore, it’ll compress by an unknown x, which is equal to mg divided by the force constant of the spring. By the way, that is a subtle thing people may not have realized. Even in the case of this spring, when you pull it, if you pull it to the right by some force. Remember, the wall is pulling to the left with the same force. So springs are always pushed or pulled on either side with the same force. We focus on one because we are paying for it, but the wall is doing the opposite. We don’t pay any attention to that. You cannot have a spring pulled only at one side, because then it will then accelerate with infinite acceleration in that direction. This spring is getting squashed on either side, and it’ll squash by certain amount x, that depends on your mass, and that x will be turned into a motion of a needle and that’ll read your mass. Now, what happens if the elevator is accelerating upwards with an acceleration a? That’s the question. The way I analyze it is, I say, if I look at me and I write the forces on me, that is mg acting down, then we use w as the symbol to represent the force exerted by the spring; w - mg = ma. That is, F = ma. When I was not accelerating and everything was at rest, ma was 0, w was mg, and w was the reading on the needle. But if I’m accelerating, the force exerted by the spring and therefore, the needle the weighing machine reads is m times g plus a. It means, when you are accelerating upwards, as the elevator picks up speed, the reading on the spring will be more and you will feel heavy. You feel heavy and it reads more because the poor spring not only has to support you from falling through the floor, but also accelerate you counter to what gravity wants to do. That’s why it is g plus a. So, you picked up some speed, then you’re coasting along at a steady speed. Then, a drops out and you weigh your normal self. As you come to the top of the building, the elevator has to decelerate, so that it loses its positive velocity and comes to rest. So a will be negative and w, in fact, will be less than mg. So, you will feel weightless for a short time or you’ll feel your weight is little. Then, you come to rest and the opposite happens on the way down. Let me just briefly look at the ride on the way down. As you start on the top and go down, your acceleration is negative. Remember, you’ve got to keep track of the sign of acceleration, so if you’re picking up speed towards the ground, a is negative, so it will be g plus a, but a is a negative number. Let me write it as g minus the absolute value of a. You can see that if a was equal to g, your downward acceleration is that of gravity, namely the cable has snapped in the elevator, then you don’t feel any weight. You don’t feel any weight because your weight is the opposition you get to falling through the floor; but if the floor is giving way and you’re just falling freely, you feel weightless. It’s wrong to think that you feel weightless because you escaped the pull of gravity. We all know that in a falling elevator, you definitely do not escape the pull of gravity. It’s going to catch up with you in a few seconds. Likewise, when in outer space, when you are orbiting the Earth, people are always floating around in these space stations. They have not escaped the pull of gravity either. They have just stopped fighting it. If you escape the pull of gravity, your spaceship will be off, won’t be orbiting the Earth. Anyway, I will return to this next time. Do your problems. There’s quite a few problems. You should start them right away. Wolfson and Pasachoff, Physics with Modern Physics, chapter 5.